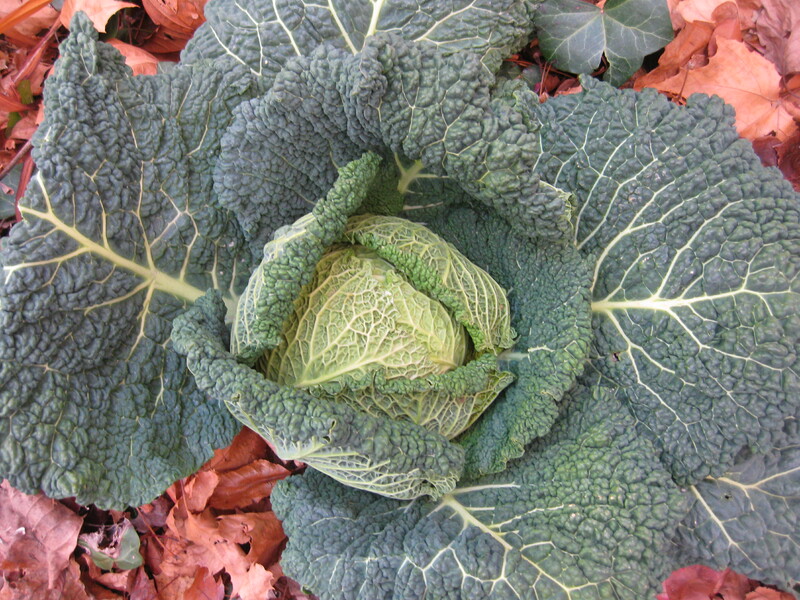 One of my great finds at the farmers’ market in the first week of the Dark Days challenge was a gigantic Savoy cabbage, with elephant-ear leaves that have a crinkly, veined creature-like texture. I didn’t need a cabbage but this one was too good to pass up. It was so crisp and fresh that even the usually tough wrapper leaves could be ribboned and shallow-boiled to make a tender and flavorful dish, as in the first Dark Days post. The drawback to this lovely specimen was the amount of space it took up in my refrigerator, now that the outside weather is too unpredictable to use the porch as a spare fridge. 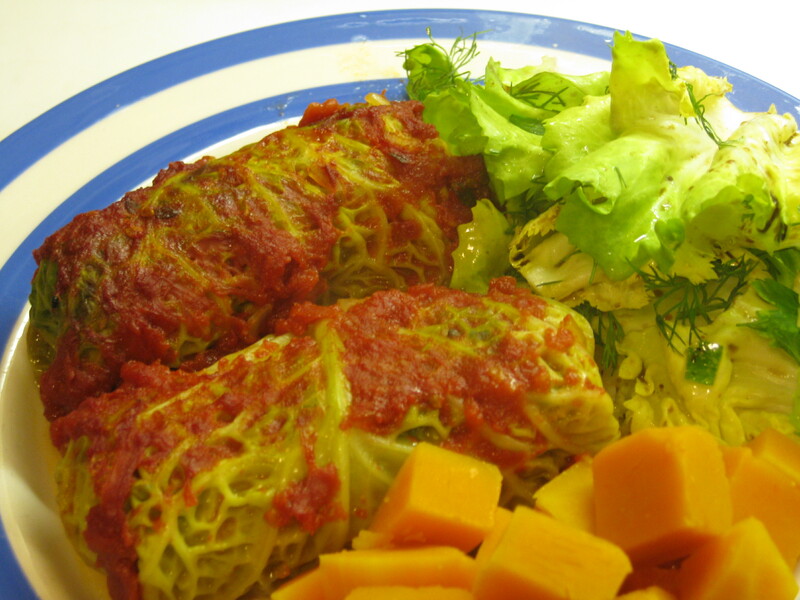 So for the second week, I made stuffed cabbage, a staple of cold-climate countries that thrive on dark days. My kids remarked that this was one of the best things they’ve ever eaten, since the cabbage was both flavorful and prevalent, and the meat and vegetable stuffing was light. This is why: I used red peppers, onions, and wrapper-leaf ribbons to lighten up the seasoned ground pork, and the wrapped leaves were covered by home-canned organic tomatoes from last year, which I needed to use up. 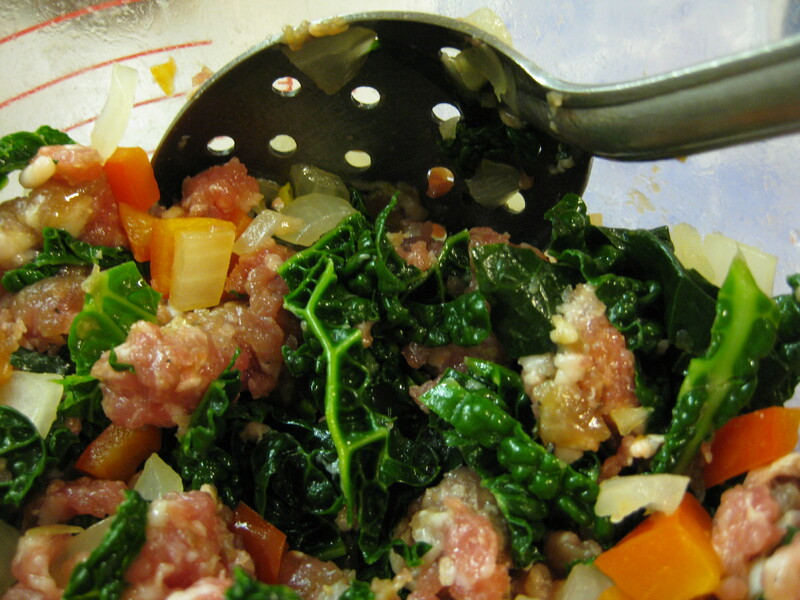 Other typical ways of stuffing cabbage with sausage or other meats would have included rice or bread. Not local. By increasing the amount of vegetable filler, and eliminating the starches, I actually got a better and more nourishing result. Go Mom. Finally, since I like to have something raw with every meal, I made a salad with local organic escarole and tiny snips of herbs from my pots and local stash – tarragon, lovage, chives, parsley, dill. While I piled everything on one plate for the group photo, we usually eat the salad as a later course. I love this challenge. It will make me a better cook. Bring a large pot of water to boil. Separate the cabbage leaves, taking care to keep them from tearing, and blanch them in small batches until crisp-tender (2-3 minutes). Remove carefully and set aside to drain. Blanch the ribboned cabbage, drain and set aside. Cut the thick ribs from the bottom of the cabbage leaves, making a v-formation. Preheat the oven to 350 degrees. 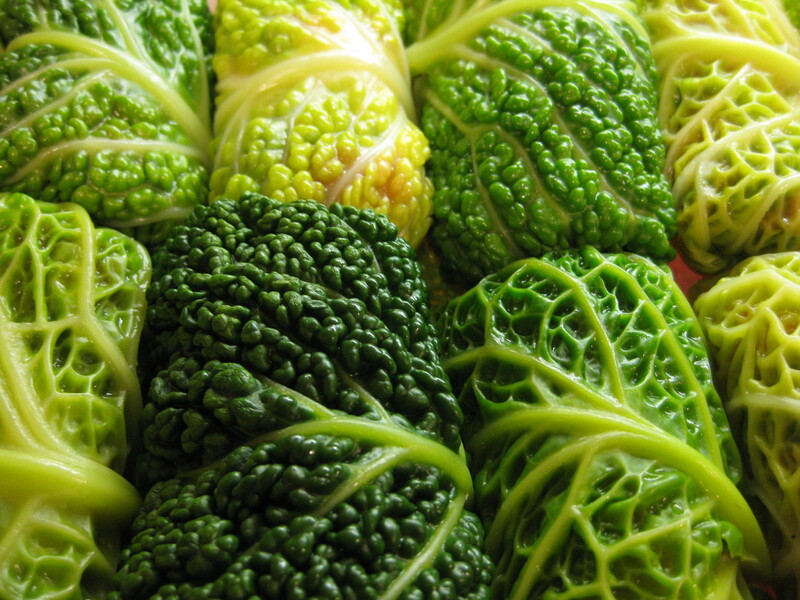 Spread the cabbage leaves flat and place ¼-1/3 c of the filling on each, just above the v-cut. Fold the bottom and then the sides over the filling and roll up, placing them seam side down in a baking pan. Spoon over the tomato sauce thinned with a little vinegar. Bake for 45 minutes until bubbly. Let set a few minutes before serving. These look delicious! I’ll have to watch for cabbage here to give it a try. I like your take on the challenge – “it will make me a better cook” – I agree! Happy cooking!